KPFT is in a one week pledge drive. The Monitor has a goal of $750. Please call 713 526 5738 to donate. Our guests this week are Richard Gage and Greg Palast. Each has something to offer our listeners. Get the DVD of Greg Palast LIVE from the Vultures’ Picnic speaking tour. 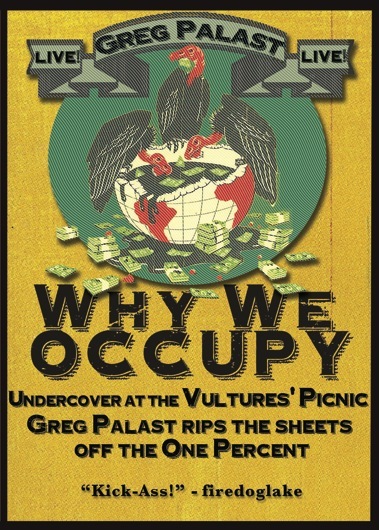 Undercover at the Vultures’ Picnic, Greg Palast rips the sheets off the One Percent. Palast shows you the documents marked “secret” and “confidential” from the files of Chevron, Goldman Sachs, Koch Industries, the IMF, WTO, bribers and billionaires. Greg Palast is the author of the the newly released book, Vultures’ Picnic and the New York Times bestsellers, Armed Madhouse and The Best Democracy Money Can Buy. Palast turned his skills to journalism after two decades as a top investigator of corporate fraud. Palast directed the U.S. government’s largest racketeering case in history–winning a $4.3 billion jury award. He also conducted the investigation of fraud charges in the Exxon Valdez grounding. Following the Deepwater Horizon explosion, Palast set off on a five-continent undercover investigation of BP and the oil industry for British television’s top current affairs program, Dispatches. This entry was posted in 9/11, Debt.